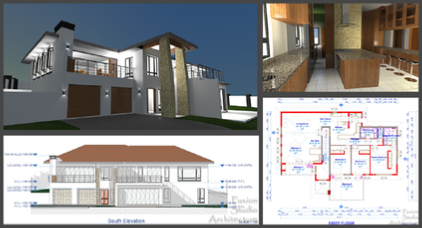 *All design projects benefit from our unique “Through the Eyes of the Designer” design process, whereby the entire design of your project, incorporates up to the minute 3D architectural visualisations. We are thereby able to ensure that you always know where the design of your home is going, and this unique design process allows for up to the minute design changes. Visit our Residential Architecture page to view some of the projects benefiting from our unique design process. Architectural Design combines a multitude of disciplines, whereby the architectural professional has to consider various aspects in order for your envisioned dwelling to be designed. 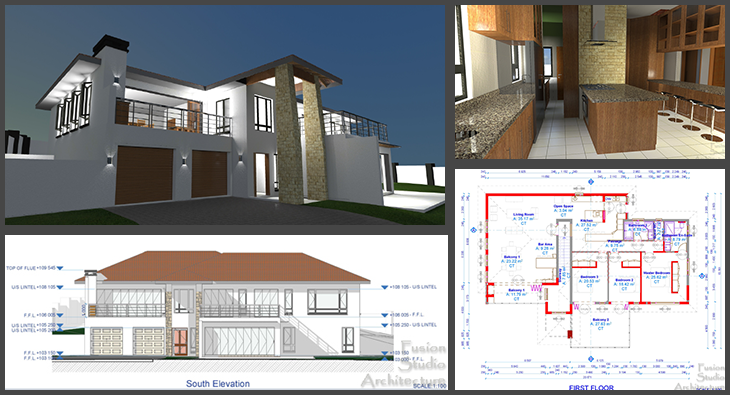 Before we start with any design work, it is imperative for us to understand your vision and your requirements for your future dwelling. We will be working closely with you during this time, ensuring that we acquire the necessary information about you and your family in order for us to define your personalised parameters. The relationship design between the kitchen, living spaces and entertainment areas, defining whether these rooms should flow into each other or whether certain of these areas require privacy from the rest of the house. We will also determine your requirements regarding the Bedrooms, and how each one of them has to be designed as well their relationship to one another as well as with their en-suite bathrooms and/or communal bathrooms. When considering the En-Suite Bathroom, we also determine how it relates to the closet spaces. Other areas to consider are the Balconies and Patio, swimming pool and entertainment areas, storage facilities and the garages. All our design considerations are done by working closely with you and your family. How will the layout of your home be influenced by your site? As you will recall, we have established all constraints regarding your site during our Property Assessment process. All the information obtained and compiled will now be used in determining our second set of design parameters. Here we are required to ensure that your envisioned design is created within the confines of any site restrictions. Determining the horizontal and vertical spatial relationship of each room is very important to how your home will feel and impact the well being of you and your family. Defining the horizontal dimensions of each room is directly influenced by the physical dimensions and movement of humans. We need to consider how we humans interact with each other and our environment and how much movement space is required for comfortable interaction. The movable elements (such as furniture) contained within our living spaces takes up a certain volume of space and the dimensions of the rooms are determined relative to the typical movable elements relative to the usage of the room. By varying the ceiling height, we are able to influence the general human experience on a subtle sensory level. Natural and artificial light has the ability to influence the mood and emotional feel of your home. An important aspect of architectural design is to study the orientation of your site and ensure that the windows are positioned and sized to ensure the optimal exposure to the natural light. In humid areas, natural and artificial air flow affects the conditions and comfort level of your dwelling more than an Air Conditioning unit. It is therefore important to study the wind direction in relation to your site, which enables us to design and position the windows installation to make maximum use of the natural air flow. The Artificial lighting installation of your home sets the evening mood, which requires meticulous attention to the layout and positioning of the installation. Through the correct positioning and grouping of the lights, we are able to highlight feature areas of your home. When designing the exterior façade of your home, we firstly consider the residential architecture of your preference. These affect the style of the windows to be used, as well as the size of the windows in relation to the walls. Contemporary architecture, for example, replaces selected masonry walls with curtain walls. The roof design impacts the façade and architectural style greatly, and dependant on your preferred style will determine whether the roof should be the normal hip & gable roof, or hip and valley, IBR or flat roof construction. The roof overhang can also play a big part in the look and feel of the exterior design, as well as being functional in the prevention of rain penetration and being used as part of the sunshade over the windows. Other elements to consider in designing the façade of your dwelling is the style of sunshade method being used, as well as feature walls and natural stone cladding to be employed. Successfully designing your future home requires extensive knowledge and research, as the effective design of your home can not simply be achieved by drawing a few lines on a piece of paper. Each element drawn onto your house plan during the design phase, embodies a multitude of factors which has to be considered and weighed-up. Architectural Design is the sum of many researched and explored parts. Contact us now for the design of your future dwelling.